Healthy trees improve the liveability of urban landscapes and improve community wellbeing, and research is helping to ensure the quality of newly planted trees so they have a long and productive life. The project Evaluation of nursery tree stock balance parameters (NY15001) involves collecting measurements from nurseries around the country to provide data backing for an industry standard known as AS2303: 2015 Tree Stock for Landscape Use. The aim is to ensure the standard effectively covers the performance of trees across a variety of climatic conditions, species, container sizes and nursery practices, to provide certainty of quality back to the customer. The work is being conducted by Western Sydney University’s Hawkesbury Institute for the Environment, funded by Horticulture Innovation Australia using the research and development nursery levy and funds from the Australian Government. Landscape markets depend on a quality product. 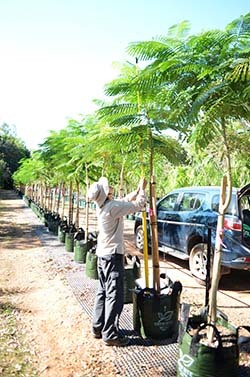 Most often, ‘real life’ conditions are much harsher than those inside a nursery, which means trees have to be in excellent condition to not only survive, but prosper in their new setting. Australia’s $1.13 billion* nursery industry is home to a rich and diverse collection of tree species, and the industry recognises the need for a standard that is ‘fit for purpose’ across the full range of available tree stock. With nursery industry initiatives like the 202020 Vision championing the importance of green space in urban areas, there has never been a more crucial time to build a data backbone for the standard. The project will help to ensure buyers such as local councils, town planners and developers can purchase trees of consistent, nationally recognised quality that are durable and resilient in Australia’s climate. Dr Court Campany has been leading the field research team, and says the feedback from the nursery industry from the start has been the importance of visiting a wide range of nurseries, growing a variety of plants in climatic regions across Australia. They have now visited over 23 production nurseries around Australia, and measured upwards of 13,000 trees, assessing below and above ground qualities, and measuring the size index of each one. Each nursery identified tree stock ready for dispatch – or available to be sold at any given time. Dr Campany and his team measured a large sample of trees in each batch in order to capture natural variation. The above ground morphological quality of each tree was then assessed. This involved testing if the tree had a symmetrical crown; was self-supporting; and free from injury, pest and disease. The below ground tests involved examining the root morphological qualities and identifying any root defects or absence of root circling. This provides important information on whether the roots are of an adequate size for the container the tree is growing in. The next step was measuring the size index on all trees in the batch – the multiplication of the height of the tree and its diameter at 300mm. This is representative of the above bulk size of the tree, which is then related to the size of the container at dispatch. Along with field trials, the project has involved a review of international peer-reviewed scientific and trade literature, which has helped to compile a database on root to shoot balance metrics and industry best practices for containerised tree stock. The two sets of data will now be analysed to develop metrics to be potentially added to the standard, as findings to date suggest the current size index does not place enough emphasis on the diversity of species grown across Australia’s climatic regions. These may include lookup tables for rapid, cost-effective quantification and categorization of root to shoot balances. An application to vary the standard will be made early in 2017 pending the outcomes and release of the research. More information about the project is available at Western Sydney University Hawkesbury Institute for the Environment website. This communication is funded by Horticulture Innovation Australia using the research and development nursery levy and funds from the Australian Government.